Americans shouldn’t have to worry about being shot at outdoor concerts, movie theaters, elementary schools, churches and nightclubs. We don’t have to live like this. Our country is at a defining moment: Do we want to live in a country where the NRA leadership’s “guns everywhere, for anyone, with no questions asked” vision prevails? Where we we are all armed to the teeth in every moment of our daily lives? This nation’s gun homicide rate is 25 times higher than the average of other developed nations. This is a uniquely American crisis. Thoughts and prayers are not enough. 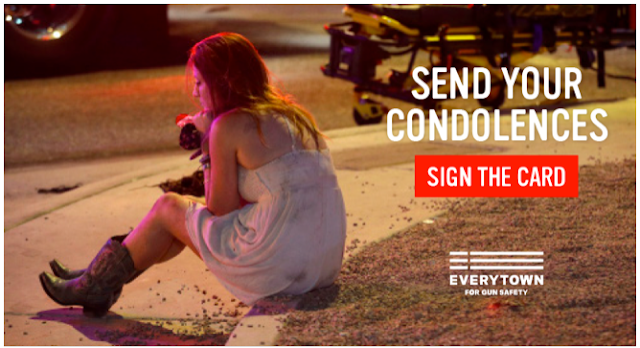 We must demand action to end gun violence. To join the movement to end gun violence, please text ACT to 64433. To honor Las Vegas, we must demand that legislators act now. First, sign the card. Then, demand gun sense.